G. Edward White is one of America’s most eminent legal historians. He has written fifteen books, many of which have won awards and honors. These works include several studies of Oliver Wendell Holmes Jr., the public life of Justice Earl Warren (with whom White clerked), an intellectual history of tort law, a volume on the later Marshall Court in the distinguished Oliver Wendell Holmes Devise History of the Supreme Court of the United States, a study of Alger Hiss, a constitutional history of the New Deal, and several collections of essays. In addition to his many books, he has authored nearly a hundred articles. Such a wide-ranging body of legal scholarship has amply prepared White for what promises to be his magnum opus, a multi-volume work called Law in American History. This first volume carries the history from the colonial period through the Civil War. The second volume, he writes in a note, will cover the period from Reconstruction to the end of the 1920s. If there is to be an additional volume, it presumably will take his study to the present. His book, White says, “is not a conventional history of American law.” It does not trace legal doctrines, official enactments, the careers of members of the legal profession, the judiciary, or other branches of government. It does include developments in the common and statutory law, decisions of the Supreme Court, and other judicial opinions. But these, he says, are subordinate to his more general concerns, which involve the ways in which law was connected to themes that he believes helped to define particular periods of American history. In his introduction, White sets out what he hopes to do. That means explaining the words in the title of his project. Narrowly defined, the law is simply “a mechanism for resolving social disputes,” but in this work White offers a broad and expansive view of law, one in which the law has “a unique, and central, role in American history.” Americans, he says, have considered law as “the ultimate source for the resolution of deeply contested issues,” and as such they have seen it as “intimately connected to the destiny of the American republic.” But since law has been so culturally important, serving as an “aspirational force” in American life, its authority has sometimes been seriously challenged, even to the point of threatening the disintegration of the nation. Finally, he has to explain what he means by the little word “in” in his title. The term, he says, seems to imply some causal relationship between law and its historical setting. Some legal historians have adopted an “internalist” perspective, contending that the law develops autonomously, driven largely by judicial discourse and intra-professional criteria that are only sporadically related to the larger society and culture. By contrast, other legal historians have followed the lead of Lawrence M. Friedman, the author of the first major one-volume history of American law, which appeared in 1973, and treated law as “a mirror of society,” lacking any real autonomy or self-propulsion. For his part, White wants to blend these two perspectives. He wants to see the law and legal institutions as both autonomous and the products of social circumstances. Such a perspective, he writes, “allows historians to read legal materials from the past simultaneously as intraprofessional documents and historical artifacts.” For White, law and history have a reciprocal relationship to one another. Although White claims in his introduction to want to emphasize those themes to which participants in the past gave the most significance, and not themes that simply resonate with historians in the present, he spends a considerable amount of time on issues of race, class, and gender—the very issues that preoccupy most academic historians today. This is understandable, since much of his account is based on the current historical literature. Indeed, much of the narrative throughout this volume is little more than an up-to-date textbook on American history. IN HIS FIRST TWO chapters, White sets forth what he believes are the principal themes of the colonial period—he simply takes for granted that they were the principal themes in the minds of the participants. He describes the displacement of the native Indians by the European settlers, and explains the different forms of holding land together with its distribution and inheritance, and recounts the patriarchal nature of the colonists’ households, including the legal inferiority of women, and emphasizes the ubiquity of dependency and unfreedom, including slavery, in the society. Many of these themes were very much on the minds of contemporaries, but the fact “that very few women had the opportunity to acquire significant amounts of freehold land during their lifetimes” was probably not one of them. White claims that in the eighteenth-century colonies “few persons involved with the enterprise of household agriculture were independent.” By the time of the Revolution, he writes, “80 percent of the American population had the status of legal and social dependents.” Since the patriarchal and hierarchal family household was the basic social institution in the eighteenth century, in which male heads possessed legal authority over all members of the household and controlled its property, the society, even as it developed commercially, “continued to reflect the dichotomy between independent and dependent household members,” a dichotomy supported by law. “It is as if no members of the labor force were truly regarded as ‘free.’” This, of course, is why slavery—the most base and degraded status in a society of several degrees of unfreedom—could be taken for granted throughout much of the eighteenth century. Since White seems to have modern standards in the back of his mind, his emphasis on the prevalence of dependency in colonial America can be very misleading. Of course most people were dependent: most people were women and children, with well over a third of the population under the age of ten. Whether it is historically meaningful to conclude, as White does, that this “society of agricultural households was a gendered society, with gender distinctions affecting the lives of all of its members,” is questionable. When all is said and done, when all the monographs stressing the ubiquity of dependency and the inferior status of women are in, we are still left with the fact that eighteenth-century white colonists as a whole possessed more independence and higher standards of living than any other people in the Western world. So when we are told things were bad and that “comparatively few” Americans had any independence, we always have to ask, compared to what or whom? WHITE HAS a very unusual mode of presenting his law in American history. Instead of integrating the law and legal issues into his historical account, he tends to narrate the history first without mentioning the law. This history is told in a more or less textbook fashion, rarely relieved by any individuals, anecdotes, or quotations. He then tacks on a discussion of the ways in which the law related to aspects of the previously narrated history. Perhaps White felt that legal scholars or general readers needed to have the history before he could meaningfully introduce any legal issues, but his layered approach—first the history, then the law—makes for tough reading. He tries to help by organizing his writing in a very schematic fashion. He constantly numbers what he is about to discuss: “four distinct groups,” “three distinct legal regimes,” “two distinctive elements,” “three sets of relationships,” “four issues of political economy,” “three formidable barriers,” and so on. White is so intent on emphasizing the contingency of events that he often ends up with a very odd conception of the historical process. Since he wants to stress that “the Anglicization of North American law and culture was not an inevitable development of the colonial years,” he offers a number of counterfactuals. Had the Spanish navy sustained into the eighteenth century the eminence it attained in the sixteenth, or had the French fleet of the 1750s reached the levels of size and sophistication the French navy achieved under Napoleon, those nations might have remained on the Atlantic coast of North America. Had the British remained entrenched in the trans-Appalachian west, instead of largely withdrawing into Canada after the Revolutionary War, the “Proclamation Line” of 1763 might have been enforced, and aboriginal tribes might have been able to retain their dominance in the regions west of the line. Even after American independence, had Britain, France, or Spain been able to maintain successful alliances with Amerindian tribes west of the Appalachians, one of those nations might have controlled the vital port of New Orleans, or helped establish a buffer zone of the tribal nations between the Appalachian range and the Rocky Mountains. But none of those counterfactuals did occur. This is scarcely what is usually meant by counterfactual history. White’s counterfactuals are not minor twists on an event such as the fall of Quebec in 1759. Instead he has posited an alternative history of the entire colonial period, one that requires an undoing of nearly everything that happened over several centuries. The counterfactuals he presents us with did not occur precisely because of the deep-rooted developments, such as the extraordinarily rapid population growth in the British colonies, that he himself has earlier told us about. Out of a comparable fear that readers might forget that the ideas produced during the Revolutionary era were simply “shifting, contingent, pragmatic responses” to events, and thus not deserving of being given “undue weight ... in assessing their historical significance,” White offers a similar alternative history for the decades following 1765. Had Parliament and the Crown acted differently once resistance to the revenue-raising measures in the colonies surfaced; had the difficulties of governance and representation over a vast ocean been resolved; had the colonists not grown and prospered so markedly under conditions of benign neglect in the early eighteenth century; or had the British government sought reconciliation with the colonies rather than seeking to grind them into submission in an ill-advised North American war effort, then America’s emergence as the first major republic in the world, and soon thereafter as the leading power in the Western Hemisphere, might have been fundamentally altered, or at least delayed. This is counterfactual history with a vengeance. ALTHOUGH White’s admission that he is not writing a conventional history of law absolves him from covering many subjects, some legal issues in the colonial period seem too important to be ignored entirely. Although nearly all the colonists in the early seventeenth century tried to limit their governments by drawing up written legal codes and constitutions—for example, the Body of Liberties of 1641 in Massachusetts Bay Colony—White never mentions them. One would never know from White’s account the legal significance of the fact that the county courts in the South came to combine within themselves various civil, criminal, ecclesiastical, admiralty and administrative jurisdictions that in England were exercised by different institutions. Or the meaning of the fact that the New England towns came to unite within themselves a host of powers that were shared by different local institutions in England—the parish, the borough, the village, the manor court, and the county. White does mention that in most colonies common-law and equity courts merged and separate chancery courts disappeared, but he never tries to explain these developments. What did it mean for people and the law that some colonies had chancery courts and others did not? Or that there were no ecclesiastical courts to probate wills in the colonies? Or that the colonists did not maintain the English distinction between solicitors and barristers? These may be small and simple matters, but somehow one feels that a major description of law in American history ought to account for some of them. White has some excellent pages on the different ways the English and colonial courts dealt with landholding, but he avoids mentioning or developing other important legal and judicial issues. He writes that “the high courts of colonies could review decisions of county courts, but rarely did so.” Is this true? The highest courts of the colonies were their assemblies, which often did overturn decisions of the lower courts. But the assemblies did not think of their decisions as the legislative commands of a sovereign. The colonists still conceived of law as Sir Edward Coke did, in medieval terms as something discovered, not made. The colonists had not yet clearly worked out our modern distinction between legislation and adjudication, and often they tended to see their legislatures as courts. Indeed, the Massachusetts legislature today is still called the General Court, retaining its title from the colonial past. SINCE MUCH OF the colonists’ law (and no one was sure how much) came from outside their society, in English statutes, legal authorities, and court precedents, and mingled confusedly with their own colonial law in courts that were, relative to the English courts, remarkably undifferentiated, the Americans’ understanding of law inevitably differed from that of their English cousins three thousand miles away. Although the colonists from the end of the seventeenth century on sought to adopt more and more English procedures and precedents in their courts (as White mentions), they only approximated English law, and did not duplicate it. This continually bred legal confusion. Many of the English common-law forms were present in the colonies, but often with defects and irregularities. The use of some writs and not others, the corrupting and blending of forms of action, the avoidance of special pleading and the insufficiency and inaccuracy of pleading in general—pleading lying at the heart of common-law jurisprudence—helped to create an atmosphere of permissiveness and uncertainty that a sharp lawyer such as John Adams, with a collection of English precedents that no one had ever heard of, could often turn to advantage. The overlapping and blurring of different and even contrary jurisdictions, such as those of probate and common law, added to the colonists’ legal disorder. At the same time, this ambiguity and complexity in American colonial law allowed for an enormous amount of judicial discretion, as judges had to pick and choose in order to adjust to local circumstances and make sense of the law. This flourishing of judicial discretion in the colonies is what lay behind the efforts of many of the American revolutionaries to codify their law in Beccarian fashion. In 1776, Thomas Jefferson wanted to turn the judge into “a mere machine,” and make the law something other than “the eccentric impulses of whimsical, capricious designing man.” White ignores nearly all of these developments. He never mentions the radical efforts to codify the law, which continued through the Jacksonian era. In his chapters dealing with the Revolutionary era, White continues with his practice of narrating the principal events—the Sugar Act, the Currency Act, the Stamp Act, the Townshend Acts, the Boston Massacre, the creation of the Continental Congress, the Articles of Confederation, the struggle over the western lands, and so on through the course of the war to the treaty of Paris in 1783 establishing American independence followed by the events that led to the formation of the Constitution and the Bill of Rights. He even includes a lengthy discussion of the treaty negotiated by John Jay with the Spanish minister in 1786 that was turned down by the Confederation Congress. White never makes clear why he feels the need to relate all these events other than to say that “political and military events, and legal ideas about sovereignty and governance, were in a continuous, and dialectical, relationship” throughout the era. This “dialectical relationship” is not at all obvious. THERE IS MUCH OF the constitutional history in the Revolutionary era that White either ignores or doesn’t get right. Since he believes that “a fully formed version” of republican government did not emerge until the creation of the federal Constitution of 1787, he has little or nothing to say about the state constitution-making of 1776–1780. He declares that the Revolutionary state governments are “best seen as provisional entities, products of a moment in history when Americans had resolved to renounce monarchy and dissolve their connections with the British Empire, but not much more.” This is an astonishing judgment, especially because the constitutional experience of the states in 1776–1780 really prepared the way for the formation of the national Constitution. 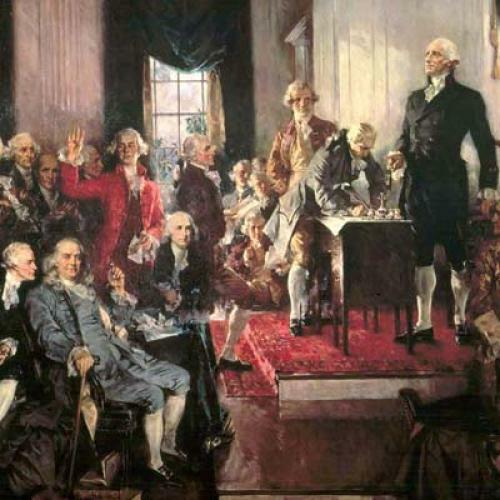 The states created constitutions as written documents, organized tripartite governmental structures, established separation of powers, fashioned bills of rights, and invented constitutional conventions and the process of ratification—all of which attracted the attention of the enlightened everywhere in the Atlantic world. The federal Constitution was derived from the experience of the states. Apart from the strange notion that the king continued “to represent” the colonists, these are not bad questions. But White’s answers are very peculiar. He seems to believe that the colonists were so caught up in their traditional assumptions of living in a patriarchal and hierarchical society dominated by patronage that their fear of parliamentary patronage was what drove them to repudiate Parliament’s authority in 1774. The colonists, he says, concluded that the various parliamentary acts were designed to increase the number of officials in America who would exploit the colonists. “They perceived those measures as an effort to increase the patronage, and thus the influence, of Parliament on classes of government ‘placemen’ in the colonies, and at the same time to reduce the patronage and influence the colonial assemblies had on such persons.” Thus “it was a straightforward matter for them to conclude that the new policies augured a recalibration of the relationship between the colonies and Parliament.” The colonists did indeed fear British placemen being dumped on them, but the empire was a royal empire, and so they knew that these would be crown officials, not parliamentary sponsored ones. After repudiating parliamentary authority in 1774, why did the colonists continue to maintain their allegiance to the king? White’s answer to this question is also odd. He claims that it was because the colonists understood that the king was the source of their liberties. “The liberties of British subjects were conferred by the king and his ministers, but only because freeborn Englishmen acknowledged the authority of those figures.” The great writ of habeas corpus, for example, was not a liberty in the modern American sense. “It was a prerogative writ, flowing from the king’s mercy and grace.” But these monarchical origins were trumped by history and the Parliamentary act of 1679. No good eighteenth-century Whig believed that the right of habeas corpus flowed from the king. In 1774–1775 the colonists ended up tying themselves solely to the crown out of intellectual necessity, not out of any desire to be ruled by the prerogative power of the king. By 1774–1775 most of the colonists had given up trying to convince the British that taxation was different from legislation. Led by Whig spokesmen such as John Adams, Thomas Jefferson, Alexander Hamilton, Benjamin Franklin, and James Wilson, they came to accept the doctrine of sovereignty; but like the Massachusetts House of Representatives, they now located this supreme and indivisible power in their separate colonial legislatures. Two legislatures in the same state, wrote Hamilton in a common reckoning, “cannot be supposed, without falling into the solecism in politics, of imperium in imperio.” Adams agreed. Two supreme authorities, he wrote, could not exist in the same state, “any more than two supreme beings in one universe.” Therefore it was clear to Adams and most other Whig patriots “that our provincial legislatures are the only supreme authorities in our colonies.” In 1774–1775 the colonists’ legislatures thus became miniature parliaments tied to the British Empire solely by a common royal executive. White misses all of this. He seems to believe that “even Parliament had limits on its lawmaking powers,” and that the eighteenth century English constitution conferred upon English subjects “rights that could not be arbitrarily infringed upon by any governing body.” If this were true, it would be interesting to know what institution told Parliament what its limits were. It is especially unfortunate that White misunderstands the problem of sovereignty. It would have helped him to explain the debate over the Constitution in 1787–1788. The opponents of the Constitution raised the same issue of sovereignty that the British had raised during the imperial debate: how could Americans have two legislatures in the same state? At first, the Federalists, as the defenders of the Constitution called themselves, tried, as the colonists had earlier, to divide up the lawmaking power. The federal government, the Federalists said, would exercise some powers and the states would exercise all the rest. But the Anti-Federalists invoked the old idea of sovereignty—that there must be in every state one final, supreme, indivisible lawmaking authority; and given the supremacy clause, they declared that that sovereign power would sooner or later end up in the national government. It was the Federalist James Wilson who once again came up with an ingenious solution—not by denying the doctrine of sovereignty, but by relocating this final, supreme, indivisible lawmaking authority in the people at large. IN HIS DISCUSSION of the emergence of the Supreme Court, White is on familiar ground, and it shows. No more layered discussion, with a narrative of events followed by some legal discussion. Instead the legal analysis, essentially focused on the development of the Marshall court, is nicely integrated into the history of the period. White then moves on to deal with “Law and Entrepreneurship, 1800–1850.” It concentrates on the transportation revolution, the disposal of public lands, and the rise of the legal profession—all of which, White contends, were related to one another. In this chapter the economic and social changes are integrated with the changes in the law, which seems to count much more in this period than it did earlier. “How much was law,” White asks, “as distinguished from markets or technology, responsible for the dramatic emergence of the transportation sector in the period? When one seeks an answer to the question, simple causal explanations fail.” And yet, when one examines the circumstances in which transportation facilities came into being, “neither markets nor technology can be identified as the primary driving forces.” In the end, White asserts, it was the law—“a series of legal documents defining the relationships between a transportation franchise, its creditors, its shareholders, and the state”—that made possible the transportation revolution. White’s next chapters are entitled “Law and the Dissolution of the Union,” with the subtitles “The Political Parties, Congress, and Slavery,” and “Slavery, the Constitution, and the Supreme Court.” The central theme of both chapters is the way in which the law and slavery interacted between 1830 and 1860 to destroy the Union. Unfortunately White tends to revert to his earlier textbook narrating of political events in the period, relieved, however, by a nice description of Frederick Douglass’s life and career. Since White is enamored of contingency in history and does not want events to be part of any sort of inevitable process, his account of the antebellum period comes pretty close to the old revisionist idea of a “blundering generation” of politicians incapable of heading off a needless conflict. “One of the major reasons for the dissolution of the Union in the decades after 1830,” he says, “was the inability of the American political system to mediate the growing rift between states in which slavery had become established, or was expected to flourish, and states that did not have slave labor and were opposed to the extension of slavery.” It was not just the elected politicians from the North and South who were unable to prevent the conflict. In 1857, with the disastrous Dred Scott decision, the Supreme Court failed as well: it “failed to craft an enduring solution to the problem of slavery in an expanding America.” It is very hard to know from White’s account just what that legal solution might have been. This is a remarkable conclusion. Not even the physical scientists conceive of truth in such a hard, final, and un-revisable way. Historians obviously bring different perspectives to their work, and perhaps none of their historical interpretation gets the past entirely right; but cumulatively their various interpretations over the years have given us an ever more complicated and more truthful understanding of the past. We now know more and have a truer understanding of the history of the law in America than we did before White began writing legal history forty years ago. Gordon S. Wood is the Alva O. Way University Professor Emeritus at Brown University. His most recent book is The Idea of America: Reflections on the Birth of the United States. This article appeared in the April 5, 2012 issue of the magazine.